Left to right we’ll start with the Antipodes Worship Superfruit Antioxidant Serum. 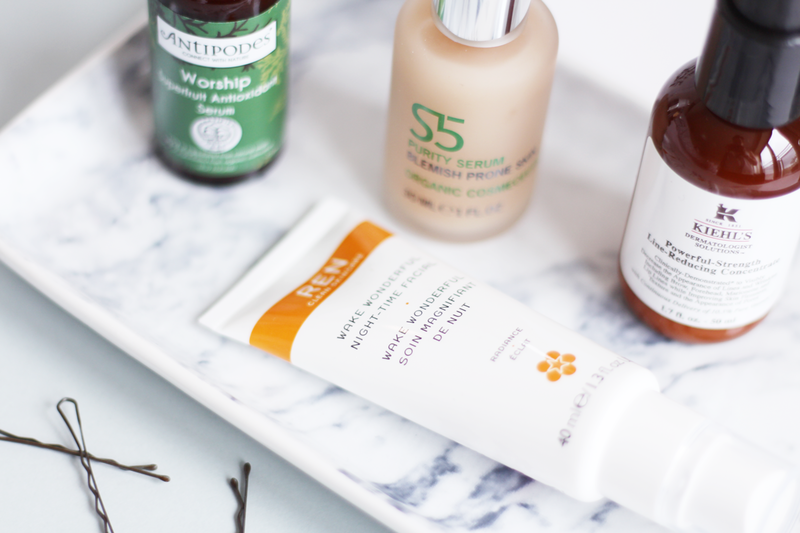 Antipodes are a brand that feature quite heavily in my skincare stash due to effective ingredients and natural stance on skincare, and this serum impresses me as much as the rest have. Primed with a variety of fruit extracts and essential fatty acids, it helps boost skin to give it a radiant and more even look. A bit like rehab for the face which I am totally down for. Next the S5 Purity Serum is one targeted at those who suffer with more blemish prone skin (hello my face) and need a bit of help balancing everything, sorting out pores and getting rid of spots and their aftermath. It uses a mix of natural oil-fighting ingredients and acids to bring some normality back to the skin, leaving it more balanced and with less blemishes! Onto the vitamin C wonder product that is the Kiehl’s Powerful Strength Line Reducing Concentrate. It contains 10.5% of that awesome vitamin to brighten skin, minimise any fine lines (for those who need it) and generally give skin a bit of a boost! It feels quite thick, but applies well and evens out skin texture like a dream. What’s more is it’s part of the House of Fraser Beauty Confidential, where you get £10 off one of your beauty favourites when you buy one of theirs. There’s so much to pick from so get shopping between the 7th (today!) and 22nd September. Finally, a new product from one of my all time favourite skincare brands, the REN Wake Wonderful Night-Time Facial. Designed to brighten the skin using a three step action, it works while you sleep to banish dead skin cells, boost cell vitality and leaves you with a glowing complexion. As expected from REN, this product is a bit of a miracle worker if your skin is feeling a little lacklustre. What do you use to boost your complexion? I’m up for ‘best longstanding fashion blog’ in the bloggers blog awards – go vote for me if you like my little blog! Also, check out my newly updated blog sale as it has to go by Saturday and see my £250 my Barbour giveaway! Ok, I’m done.